Washington, DC has another great lineup of activities and events for the end of April. Take a look at exhibits and performances, or head out for an evening baseball game. The National Gallery of Art near Gallery Place will feature the exhibition Orientalism: A Selection of Prints and Drawings on April 21. View the works of eighteenth and nineteenth-century artists and discover the European fascination with the east. Located about a mile from Mather Studios, the African Art Museum will have the upcoming exhibit Earth Matters: Land as Material and Metaphor in the Arts of Africa on April 22. About 100 works of art will show how the land itself has influenced African artists. The Tasting Room at the National Harbor, about five miles from The Oronco, will be having an Oyster Festival on April 27. Sample oysters and wine from 1 p.m. to 4 p.m. Don’t forget to purchase a ticket if you would like to go. The American History Museum will have the exhibition I Want the Wide American Earth: An Asian Pacific American Story starting May 1. Visitors will learn about the culture and stories of Asian Pacific immigrants. The Studio Theater in Logan Circle will feature Pas De Deux on April 24. Pas De Deux is in fact two separate plays: Skin Tight and 2 – 2 Tango, each with a two-person cast that examines the ups and downs of adult relationships. Pas De Deux is intended for a mature audience. Guitarist Robbie Schaefer and Jake Armerding will be performing at the Wolf Trap Center for Performing Arts, about ten miles away from incredible Arlington penthouses. Known for his work with Eddie from Ohio, a Virginia band, Schaefer has been recognized for his insightful folk songs. The concert starts at 8 p.m. on April 26. The Washington National Opera will perform Show Boat at the Kennedy Center near the Foggy Bottom neighborhood from May 4 through May 26. The acclaimed Hammerstein play is approximately 2 hours and forty five minutes long. The Washington Nationals will be playing home games all next week. Here’s what their schedule looks like for the end of April. April 22 – Cardinals – 7:05 p.m.
April 23 – Cardinals – 7:05 p.m.
April 24 – Cardinals – 1:05 p.m.
April 25 – Reds – 7:05 p.m.
April 26 – Reds – 7:05 p.m.
April 27 – Reds – 1:05 p.m.
April 28 – Reds – 1:35 p.m.
Saxaphonist Gary Louie will give a free performance on April 19 at the McNeir Hall in Georgetown University, only minutes from Wormley School. Dance Metro DC is coming to the Kennedy Center’s Millenium Stage on April 29. The free performance begins at 6 p.m.
Dupont Circle’s Phillips Gallery has The Migration Series by Jack Lawrence. His paintings examine the movement of African Americans to the north in the first half of the twentieth century. 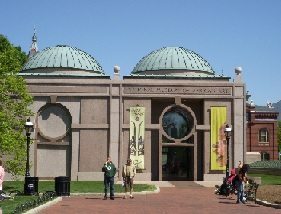 Free admission Tuesday through Friday.